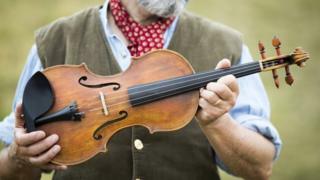 A violin has been built by a craftsman to mark Emily Bronte's 200th birthday. Steve Burnett, an established violin maker, used wood from a tree that grew close to where she wrote at the parsonage in Haworth, West Yorkshire. Mr Burnett, who is based in Edinburgh, said the felled sycamore tree could have been old enough to have been there during Bronte's life. "Hopefully it will be played in the parsonage itself as time goes on," he said. Although Bronte did not play the violin, in her novel Wuthering Heights Mr Earnshaw does bring a fiddle back over the moors but finds it in pieces after his arduous journey, Mr Burnett said. He said the violin "in an artistic sense, has come back to the moors". Mr Burnett hopes the violin will be used schools and it is to be played as part of Edinburgh Festival. The Bronte Parsonage is holding a series of events to mark the bicentenary, culminating in Bronte's 200th birthday on Monday. She was born on 30 July 1818, in Thornton, Bradford. In Thornton a special pillar box has been unveiled featuring quotations from her work. Mr Burnett has also made a number of instruments from trees with connections to historical figures or events. These include a Sherlock Violin in tribute to Sir Arthur Conan Doyle. He has also honoured World War One poets Wilfred Owen, Siegfried Sassoon and Robert Graves.